This charming, free-to-play endless runner brings Sackboy and the LittleBigPlanet to a Vita near you. Check out the launch trailer below! This title hit the mobile market in late 2014 and is now just arriving on the Vita. How does it play? I just downloaded it today so a review will be arriving sometime for this. But in the meantime enjoy the launch trailer. Why not pick it up? It's free. 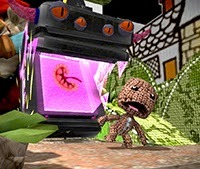 It's got Sackboy in it. Go ahead. Hey readers! Have you tried it yet on your Vita? Let us know below!